For the first time ever, scientists were able to spot the formation of a planetary system. 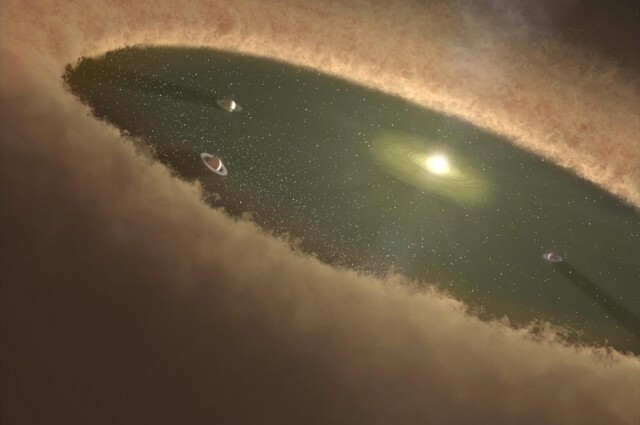 A research paper, published in Nature, proposes that the detected objects are newborn planets, presently being pieced together by tremendously hot gas and dust. By means of images of the system captured between 2009 to 2015, the group of astronomers was able to detect two protoplanets – small objects that go on to form planets – together with a potential third, orbiting a star LkCa 15 in an elliptical orbit, as it is expected of planets. Spotting planets forming is quite a difficult task. Newborn stellar systems are generally shielded in a cloud of dust that blocks our view, making usual observing methods unfitting. The group of astronomers consequently had to come up with a different method to study the system. Newly formed stars yield large disks of material from which planets form. As developing planets move over this protoplanetary disk, they generate gaps in the swirling debris, which astronomers can spot using infrared light. Numerous protoplanet candidates were spotted this way. For this recent discovery the team pooled observations in infrared from the Large Binocular Telescope, with hydrogen-alpha examination by the Magellan Telescope. The gap around the parent star LkCa 15 was first detected in 2011, which showed the potential for the star to have at least one exoplanet. For this newest study, astronomers were able to detect hot gas (9,700°C [17,500 °F]) sinking onto the closer planet LkCa 15b. Examining the data from the system, astronomers realized there were other discharges in the gap: One signal was acknowledged as a second planet after being observed numerous times. A third discharge is supposed to be another planet but is yet to be confirmed. This finding and the success of this method offers new opportunities to study how planetary systems form and how new planets interrelate with the disk of material around the star.